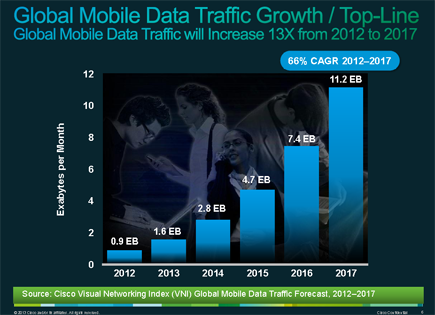 Global mobile data traffic will increase 13-fold over the next five years, reaching 11.2 exabytes per month (or an annual run rate of 134 exabytes) by 2017, according to the newly released, sixth annual Cisco Visual Networking Index (VNI) Global Mobile Data Traffic Forecast. This represents a compound annual growth rate of 66% -- a slight decline from the 70% CAGR forecast last year due a slowdown in connected laptop sales especially in western Europe. Nevertheless, the growth rate in mobile data traffic the growth rate in global fixed data traffic by three times. Cisco's study attributes the rapid expansion to the evident factors: more mobile users, more mobile connections, faster mobile speeds, and more mobile video. 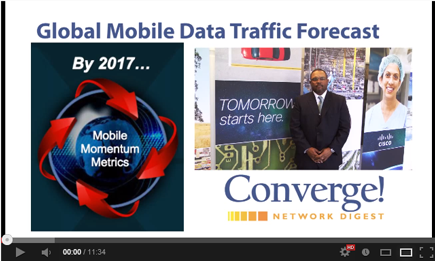 “By 2017, global mobile data traffic will reach levels that are truly remarkable. Imagine 30 trillion images, or 10 images per day, being sent by every person on this Earth. Or, the Earth’s entire population sending three trillion video clips, or one daily video clip for a year. Those staggering numbers will happen by 2017. It represents what we see as a tsunami of data flowing over the world’s mobile Internet to satisfy our need to connect people, data and things as part of the Internet of Everything," stated Doug Webster, vice president of product and solutions marketing, Cisco. By 2017, there will be more than 10 billion mobile-ready devices/connections, including more than 1.7 billion machine-to-machine (M2M) connections (up from 7 billion total mobile-ready devices and M2M connections in 2012). Average global mobile network speeds will increase 7-fold from 2012 (0.5 Mbps) to 2017 (3.9 Mbps). By 2017, mobile video will represent 66 percent of global mobile data traffic (up from 51 percent in 2012). M2M traffic (such as GPS systems in cars, asset tracking systems, medical applications, et al.) will represent five percent of 2017 global mobile data traffic. In 2012, 33 percent of total mobile data traffic was offloaded (429 petabytes/month). By 2017, 46 percent of total mobile data traffic will be offloaded (9.6 exabytes/month). In 2012, 4G connections accounted for 14 percent (124 petabytes/month) of total mobile data traffic. By 2017, 2G networks will support 33 percent of global mobile devices/M2M connections; 3G networks will support 57; and 4G networks will support 10 percent. By 2017, 4G connections will account for 45 percent (5 exabytes/month) of total mobile data traffic. 4G traffic will grow 40-fold from 2012 to 2017, a 109 percent CAGR. In 2012, the average 4G connection generated 2 gigabytes of mobile data traffic per month, which is 18 times greater than the 0.110 gigabytes/month for the average non-4G connection. 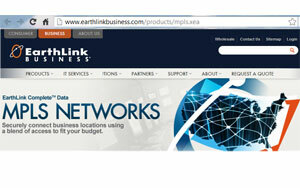 EarthLink is introducing a Data Center Connect option that enables clients to leverage the EarthLink private MPLS network to access the cloud by interconnecting one or more sites to EarthLink SSAE 16 SOC 2 compliant data centers. The Data Center Connect service ensures that the client's application traffic between the data center and the MPLS network is protected by redundant paths and infrastructure, enhancing service availability and improving the value derived from each cloud-based service. EarthLink said its Data Center Connect service also offers a special burst on demand option that can double the port speed on demand, delivering network flexibility that scales when needed. The EarthLink Data Center Connect service honors Service Level Agreements (SLAs) up to the full burst bandwidth, ensuring that the bandwidth is always available and Class of Service policies are fully supported. Every EarthLink MPLS connection includes 10 Mbps of bandwidth to a data center, allowing customers to build out their cloud infrastructure on a phased basis, adding additional bandwidth as needed. AT&T signed new global telepresence interconnection agreements with T-Systems and Tata Communications. 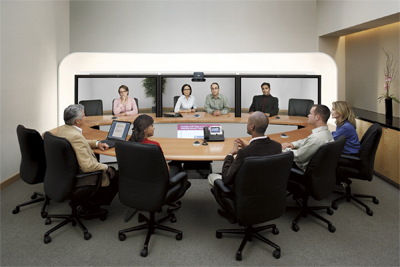 AT&T also announced that its telepresence solution is one of the first Open Visual Communications Consortium (OVCC) compliant services, offering customers multi-vendor video collaboration across a range of service providers. In addition, AT&T has expanded its offering with BT and Orange Business Services through the OVCC’s first wave of compliant video services, creating a larger ecosystem for users to collaborate through video. "As a leader in pervasive video collaboration, we are committed to providing global interoperability across service providers and endpoints,” said Alan Benway, Executive Director of AT&T Business Solutions. “These agreements demonstrate our progress in providing customers with increased opportunities to improve how they work with suppliers and business partners through global video collaboration." Tarana Wireless, a start-up based in Santa Clara, California, emerged from stealth and announced its entry into the market for small cell backhaul equipment. Tarana will feature a Concentrating Multipoint (CMP) backhaul topology comprised of two different wireless devices – concentrator nodes (CN) and end nodes (EN). Each EN connects directly to a small cell and provides dedicated backhaul capacity. Tarana devices are configured to form a single hop star with the CN aggregating links and capacity for multiple ENs. The company said it will support both non-line-of-sight (NLoS) to line-of-sight (LoS) operation. 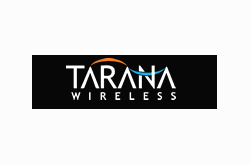 Tarana Wireless was privately funded in 2011 by a syndicate of four globally diversified investors. The company traces its origin to a distinguished team of engineering researchers associated with the University of California, Berkeley. Tarana co-founders are Sergiu Nedevschi Ph.D., chief product officer; Dale Branlund, chief technology officer; Omar Bakr Ph.D., chief scientist; Rabin Patra Ph.D., vice president systems, and Kevin Jones, vice president product innovation. Steve Sifferman, president and chief executive officer, joined the dompany in 2011. He previously held executive positions with ArrayComm and Powerwave Technologies. Infinera reported Q4 2012 revenue of $128.1 million compared to $112.2 million in the third quarter of 2012 and $112.0 million in the fourth quarter of 2011. GAAP gross margins for the quarter were 34% compared to 37% in the third quarter of 2012 and 40% in the fourth quarter of 2011. GAAP net loss for the quarter was $(16.1) million, or $(0.14) per share, compared to net loss of $(19.1) million, or $(0.17) per share, in the third quarter of 2012 and a net loss of $(19.4) million, or $(0.18) per share, in the fourth quarter of 2011. Overall Wireless LAN market revenues are forecast to exceed $11 billion in 2017, nearly 50 percent greater than 2012 revenues,according to a newly released market forecast report by Dell'Oro Group. Key drivers include deployment of Service Provider WiFi (SP WiFi), the 802.11ac upgrade cycle, cloud-managed WLAN, consumer video over WiFi, and the Bring Your Own Device (BYOD) trend. "Today's enterprise applications are now built for mobile devices, enabling workers to be nomadic. The emphasis on mobile devices places new demands on the corporate wireless infrastructure. It also forces companies to maintain connections to employees while they traverse to cellular networks, and drives the need to apply consistent access rules for both Ethernet and wireless access systems," said Chris DePuy, Vice President at Dell'Oro Group. 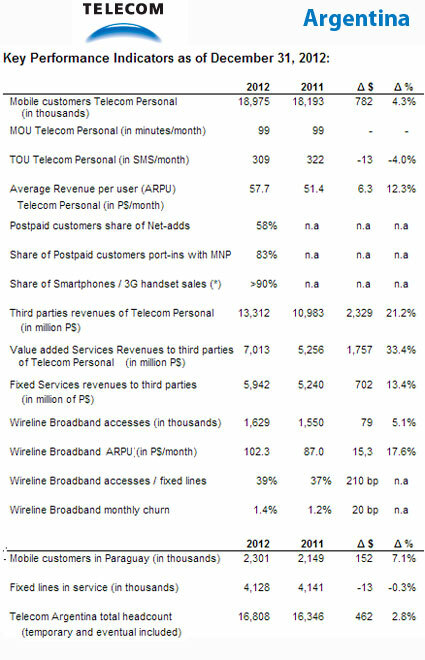 Telecom Argentina reported 2012 revenue of 22,177 million pesetas, up 19.6% over 2011, while operating income rose 9.6%. The 2012 CAPEX amounted to 3,257 million pesetas, up 2.0% over the 2011. Telecom New Zealand will deploy an Alcatel-Lucent 100G optical network to more than 30 cities nationwide. The upgraded backbone will support high-speed transport services and the introduction of a retail fibre product as part of the New Zealand government’s Ultra-Fast Broadband initiative. Network launch is slated for the middle of 2013. Financial terms were not disclosed. SK Broadband, a subsidiary of SK Telecom, has picked Alcatel-Lucent to build a packet transport network for enterprise data services in South Korea. Specifically, SK Broadband will deploy Alcatel-Lucent’s 1850 Transport Service Switch managed by its 1350 Optical Management Suite (OMS). Financial terms were not disclosed.